Simply, it's a movie about love between two chefs. 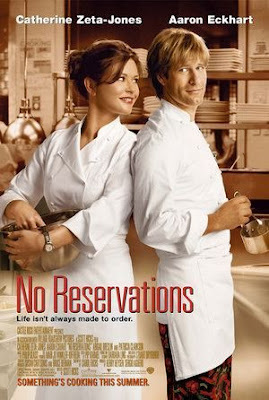 No Reservation -- a movie talking about a punctilious and confused chef, Kate regains her love for life and changes to act as herself in & out the kitchen. PG for some sensuality and language. I wish there was a cook book for life, you know, and do recipes telling us exactly what to do. I know, I know,you're going to say how else have you learnt. (Kate's phychologist) Kate, no, actually I wasn't gonna say that. You wanna guess again. (Kate) No, no, go ahead. (Kate's phychologist) But I was gonna say was you know better than anyone. It is the recipes you created yourself that are the bests.